Have an upcoming flight with your baby? Especially if it’s your first time, you’re probably worried about disturbing other passengers. Perhaps, you’re simply a lonesome passenger trying to sleep on a long-haul flight but couldn’t because the loud lullaby of the baby on the row behind you doesn’t help to put you to sleep? No matter which side you are on, you don’t have to worry because you’re not alone. Many moms and passengers have to deal with this scenario every day and fortunately, there are simple ways you can do to calm these angels and let you and other passengers fly comfortably. Bring The Most Essential – Goodie Bags! Children easily get bored. So, if possible, wait for the final boarding call before getting on the plane. If you’re traveling with little kids, have your partner or a flight attendant to prepare the car seats while you and your kid are waiting for the final boarding call. By doing this, you kid is not cooped up on a jam-packed plane longer than necessary. You will have more time to prepare them or even put them to sleep if you’re lucky! Goodie bags can do wonder. Goodie bags may include toys, candies, coloring books, or anything that you know will keep them occupied. These will prevent your kids from getting bored and if you have more than one kid, help them work on each other's nerves. As soon as you notice your kid gets irritable, give them the bags over and let them do their thing. Letting your kid pack their own backpack make them feel independence or like a "grown up." They are going to enjoy making decisions for themselves and doing activities only people they look up to usually do. Better yet, they would love to help you with your task. You have managed to survive the plane trip with your trip, congratulations! Once you get your luggage, your kids would have the urge to take another ride, but this time on the airport baggage conveyor - its carousal effect is going to make them totally hypnotized. So, unless you want your kid to have their solo flight to Europe, keep your eyes on them and keep them away from the conveyor. A good pair of headphones and an audio player always comes in handy when you are traveling. It would also be a good idea to pre-download some movies on your electronic devices before the flight. Not only you’re going to save yourself from a headache listening to a crying baby, but you’re also going to be occupied and entertained during the flight time. If the baby is not yours, just don’t touch them! Especially if they are sleeping, resist yourself no matter how cute you think they are. Touching a baby you don’t know, especially on an airplane is like a ticking bomb. If you know that there’s no way you can deal with a loud crying of a child on your flight, see to it that you book earlier and specify your seating preference. As soon as you see that there is a baby in the same row you are assigned to, eye for an empty seat and ask a flight attendant if it’s okay for you to transfer to another seat. Most of the time, this is admissible. You’re probably wondering why, especially that you’re not a parent with a baby on board. Sometimes, parents have a lot of things to handle that packing snacks to give to their kids is one of the last things on their mind. If you’re sitting next to the cranky child, offer them a lollipop or some candy that will keep their mouth busy. Most of the time, it works in keeping them quiet until they get calmed. Traveling with a crying baby on the plane surely is one hell of a ride (pun intended)! But there are some ways to survive it. 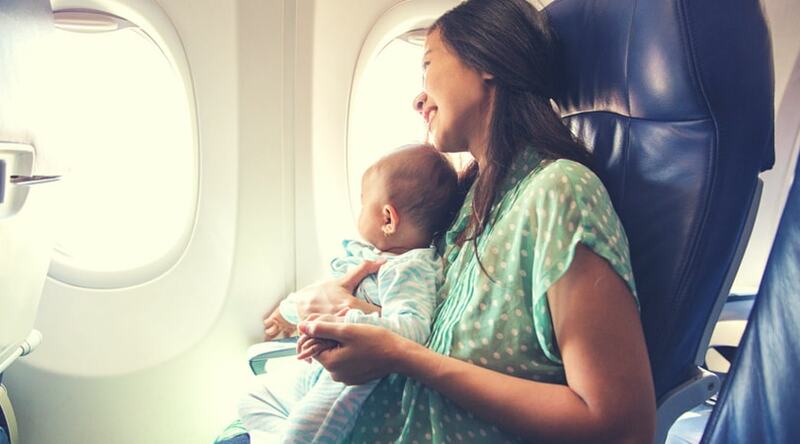 We hope these useful tips have been helpful in helping you prepare yourself whether you’re traveling with an infant or a toddler, or you’re simply a solo passenger who just wants to enjoy his flight.